Wheel Gymnastics turns the world upside down. Wheel Gymnastics consists of Gym Wheel and Cyr Wheel. 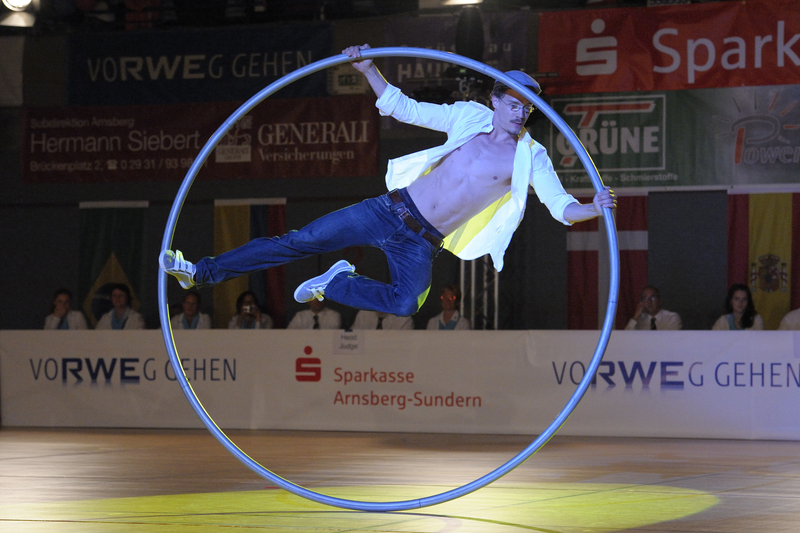 There are three competitive disciplines within Gym Wheel: straight-line, spiral and vault. Cyr Wheel was added to the IRV’s competitive program in 2013. The Cyr Wheel, a wheel with only one rim and no handles, with its alternative and innovative moves ads a new and spectacular dimension to the fascination of Wheel Gymnastics. IRV is the international representative body for the sport of Wheel Gymnastics, that organizes World Championships, Team World Cups, the Wheel Workshop Week including the Open Mixed Masters, coaching and judging courses, training and youth camps. It is also responsible for the international Code of Points and the certification of international judges and coaches. The IRV promotes the sport around the world and incites the international community to collaborate closely with the executive board. For this collaboration instruments like the Athlete Commission and specific working groups have been installed. The IRV is based in Switzerland and has an executive board and a technical commission comprising nine representatives from different countries who work on a voluntary basis to pave the way forward for the federation. In 2018 the highlight of the year were the World Championships in Magglingen/Switzerland with about 120 gymnasts from 13 countries. Beside the competitions, Magglingen was also a place of many encounters and a forum to further develop our sport. Experts from the sports and circus world brainstormed together in the overall aim to find new ways to create even more interesting and compelling routines. In addition to that, judges thought about a simpler and fairer judging system. April 2019 will see the first ever Wheel Gymnastics competition in Japan. The four best national teams of the World Championships (Germany, Japan, Switzerland and the Netherlands) will travel to Akita in Northern Japan to take part in the Team World Cup 2019. For the WSG 2019 in Tortosa the IRV will establish a new event and competition format: The IRV Wheel Workshop Week and the Open Mixed Masters. The focus is on fair play and inclusion as well as international interaction and mutual understanding in sport. Within the Wheel Workshop Week outstanding international athletes and trainers will give training tips and hints on how to improve the participants’ individual Gym and Cyr Wheel performances - fun and progress guaranteed. In the Open Mixed Masters competition female and male Cyr and Gym Wheel gymnasts of all ages, nationalities and levels will team up in and perform six routines. And in 2020 the Wheel Gymnastics community will meet again in New York City for their 15th World Championships.